This is just a very quick post. I wanted to follow up and prove just how tempting fresh and potentially profitable "new keywords" are. 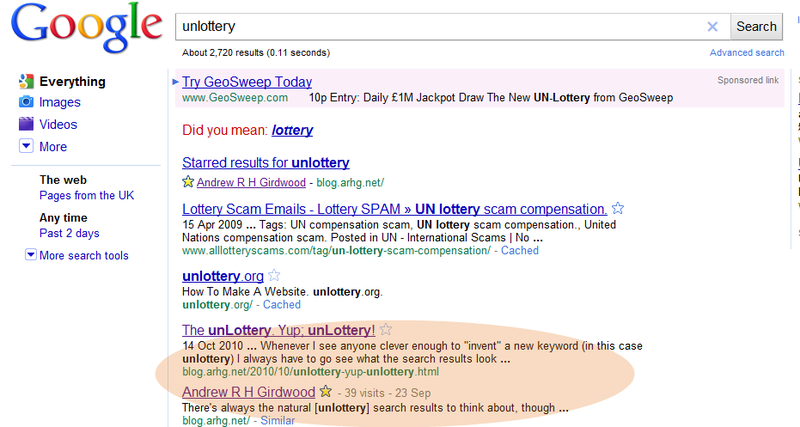 This blog has nothing to do with the lottery - in SEO terms; no relevancy. However, I'm currently ranking for [unlottery]. Twice. It took about 10 minutes and that includes content creation time. Mind you; that result isn't half as impressive as this one. 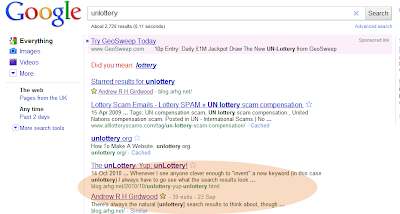 What will likely happen, of course, is that as/when/if the phrase [unlottery] becomes more popular, more relevant blogs and sites will pick up the phrase and use it. GeoSweep's actually affiliates are sure to use it. This post will fade into history.